Genestra Melatonin Spray helps increase the total sleep time in people suffering from sleep restriction or altered sleep schedule. It helps relieve the daytime fatigue associated with jet lag and helps re-set the body's sleep-wake cycle. My Naturopath carriedt the Genestra brand so I trust it. The spray is pleasant, (minty), and I find it effective without having a sedative affect. It is my go to sleep remedy. It works. I tried melatonin tablets before, but it did not work. I spray twice in my mouth, and that is it. One of the top Melatonin's on the market! I absolutely love that it comes in a spray format as it absorbs easily and works fast! I have bought about 6 bottles so far and will continue to buy! This is the only melatonin product I swear by after trying many across the years. Before bed if I'm antsy it helps me shut off almost instantly. Great product; taste is pleasant. I am a longtime user of this product. Excellent to help me get to sleep on stressful nights. Thank you Genestra. This lovely spray doesn't taste like cat vomit, like the lesser expensive but revolting competitors' sprays. Lovely mint flavour, happy dreams, and a rested me. Thank you so much for this product!!! Great product! Great taste and works well. Seems to help me not wake up during the night! Tastes like spearmint and works well. My husband loves this stuff. He typically doesn't sleep well, but 1 spray and he falls asleep quickly and feels rested when he wakes up. 2-3 sprays and he wakes up feeling groggy. Happy we found this! Amazing product. Tried other melatonins before, nothing ever worked for me. This product works every time, bought some for my sister right after I tried it myself! Love it! 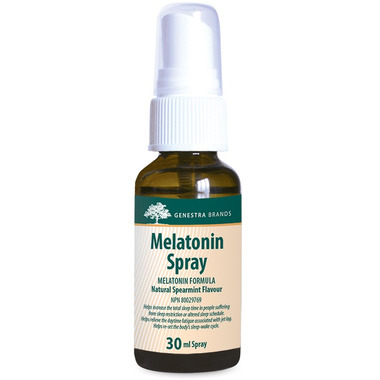 Love Genestra's melatonin spray and have been using it for years. Just two squirts before bedtime and it's zzzzzzz for at least 6 hours. And I find this brand leaves you less groggy in the morning. This spray version of melatonin allows it to work faster than taking a pill or tea.